Arche-de-Noe VACANCES price per day from CHF 110 Arche-de-Noe VACANCES is only 7 km away from the Les Bugnenets – Savagnières ski resort. Free Wi-Fi and a flat-screen cable TV are provided in this two-bedroom apartment. Each room features a unique decoration, with decorated wallpapers and hardwood floors..
La Prise price per day from CHF 190 . Apartment with garden, recommended by travellers ! Holiday Home La Colline Le Noirmont . Maison DuBois Set in an 18th-century watchmaker’s shop, this hotel in Le Locle offers rooms with free Wi-Fi and kettles. Guests enjoy their meal at a traditional watchmaker’s workbench. Logis de la Licorne price per day from € 61 Dating from 1688, this historic hotel in the village of La Ferrière is just a 10-minute drive from La Chaux-de-Fonds. 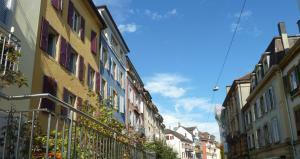 The restaurant serves traditional Swiss cuisine and Jura specialities. Hôtel de la Gare price per day from € 73 This 3-star hotel is located in the centre of Saignelégier, only a few steps from the train station. The restaurant La Taverne serves traditional Swiss cuisine and seasonal specialities. Les Rives Du Doubs price per day from € 67 The quiet location with a great view over the lake of "Les Brenets" makes the special charm of this hotel. Restaurant with a panoramic terrace, where regional dishes and fresh fish are served.